You are looking at someone wearing a Baymax costume while learning how to be a flight attendant. As one does. A flight attendant trainee from Sichuan Southwest Vocational College of Aviation was apparently stuffed in a Baymax costume. Here you can see her in front of the mock airplane. Some of those flight attendants sure are getting handsy with the Baymax lady! Big Hero 6 is popular in China, where it's been doing well at the country's box office. 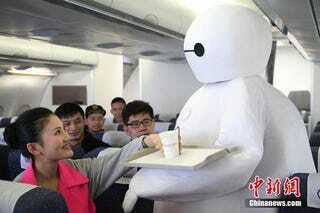 Since Sichuan Southwest Vocational College of Aviation has done other cross-promotion type publicity stunts in the past, Baymax's appearance at the school isn't totally out of left field. Baymax also taught a room full of flight attendants. Probably a good lesson on feelings and warm hugs. Or, it seems, this gent was put into a Baymax outfit, too. You know, Baymax really makes everyone so happy and spreads the love around. Even when he stares at you while you are reading. Or creeps into the women's restroom with flowers.